Tarot X8 multicopter frame is specially designed for professional aerial photography or FPV users. It comes with the new style electronic retractable landing skid, umbrella type folding arms, integrated PCB board which make the power wire and ESC wire connections more safety. Meanwhile, it provides enough installation space for flight controller or other equipments. For the Tarot X8 multicopter frame, if one of the arms stopped working by accident, the multicopter frame could still in stable status. The main feature of this frame is light in weight, and easy to carry. The max take-off weight is about 10kg, and it is easy to carry the Canon 5D camera with the gimbal. The flight time is about 15 minutes. The state intellectual property has been awarded the TAROT model.,ltd five patents. Any units orindividual without the license holder manufacture ��copy ��use and sale the product will be patent lawsuit. Folding arm design on the Tarot X8 decreased much preparing time before flight. The 4 direction lock folding design with patent make the arm lock on the frame firmly. Black and red color main frame design has strong visual effect. The battery hang under the frame design make the gravity center lower, and it provide more installation space. 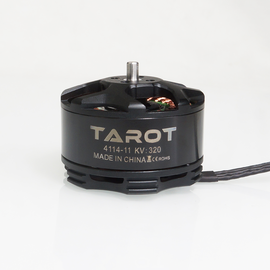 The Tarot X8 comes with high strength PCB board; the power plug adopts the AS150 anti-spark connector. The user could get more flight time from the light frame. The electronic retractable landing skid has reverse power protection and failsafe function. The retractable landing skid could provide broader views for aerial photography.